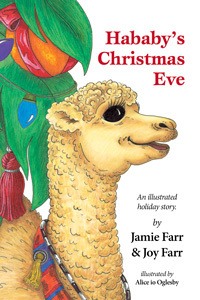 Hababy’s Christmas Eve: An illustrated holiday story was written by Jamie Farr & Joy Farr and was the first full-color children’s book I illustrated. Originally published in 2003, it was reissued in 2010, and converted to an eBook version in 2012, complete with an audio recording of Jamie reading the story for the iPad version. The illustrations were all created by hand using a technique that combines the brilliance of markers with the detail of colored pencil. I used a high quality velum paper, which is translucent, ink pens, professional design markers, colored pencils and paint on some of the images. Being able to work both the front and the back of the velum allowed me to layer the colors and draw in details that would be much harder to create on a single sided paper. More on this technique in a future post. Print copies of Hababy’s Christmas Eve can be purchased on Amazon, via local booksellers, or my Online Shop. Requires iBooks 1.3 or later. For use on iPad, iPhone, iPod touch. See iTunes store for full requirements.